The trials and tribulations of three young Arab women in Tel Aviv. Adjectives like 'brave' and 'daring' are all too often thrown out in relation to filmmakers, but in the case of those attempting to make films in the Middle East, such labels are indeed appropriate. Despite being the subject of a filmmaking ban imposed by his government, Iran's Jafar Panahi has managed to elevate his career by finding loopholes in the system that allow him to defy the authorities who seek to silence his voice. Saudi Arabia's Haifaa al-Mansour was forced to direct her debut film Wadjda using walkie-talkies to communicate with her crew from the back of a van. 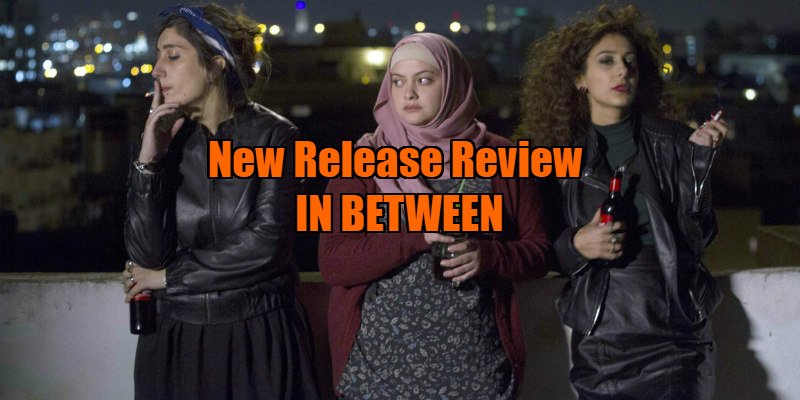 Now Palestinian filmmaker Maysaloun Hamoud finds herself the subject of a fatwa thanks to her feature debut In Between. Hamoud's film is the story of three young Palestinian women sharing an apartment in the Israeli city of Tel Aviv. Chain smoking and coke snorting Layla (Mouna Hawa) is a lawyer who in spite of her feminist ideals, just wants to find herself a decent guy. Salma (Sana Jammelieh) is a struggling DJ who keeps her lesbian lifestyle a secret from her conservative Christian family. The hijab clad Nour (Shaden Kanboura) is initially shocked at the liberal lifestyles of her new housemates, but soon finds them more affable than her domineering fiance Wissam (Henry Andrawes). 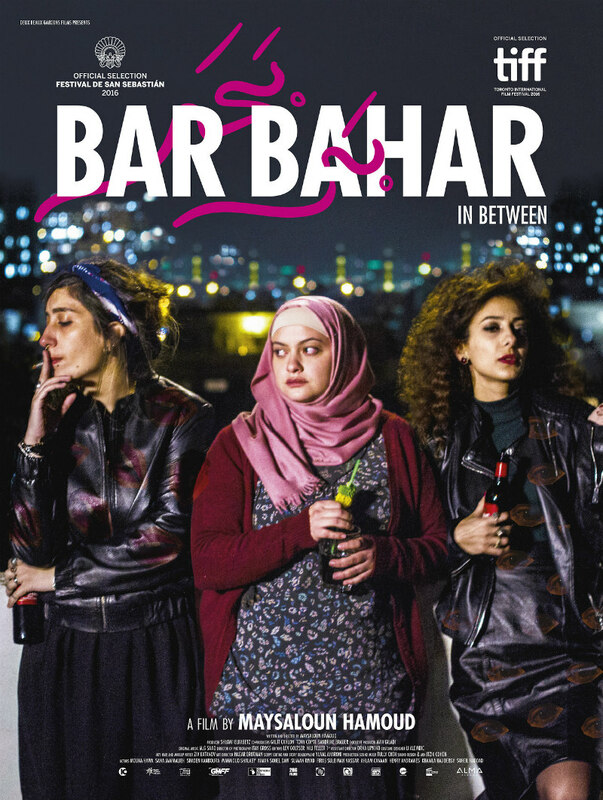 As Arabs in Tel Aviv, the three women find themselves torn between cultures. Though Layla and Salma dress so as to be indistinguishable from the young Jewish women of their city, they're reminded in small ways of their outsider status. Layla rebuffs a suitor by reminding him that his mother's desire is for him to find a nice Jewish girl, while Salma storms out of her day job in a restaurant kitchen after refusing to stop speaking Arabic with her co-workers - "It puts the diners off their food," she's told. Yet Layla and Salma are even more distanced from their own cultures. When the latter's sexual preference is discovered at a dinner party, her parents attempt to keep her under house arrest until she agrees to marry a man of their choosing. As Salma's father berates her, tears cloud his eyes, and the suggestion is that he's in pain at the fact that his religion forces him to treat his daughter in such a manner. The secular Muslim Layla meanwhile discovers that the Muslim men who call themselves liberals in her presence are still wedded to tradition, and are unwilling to introduce such a staunchly independent woman to their families. Nour is the odd one out, and the weakest of the trio in terms of drama. Her arc is a lot more free of nuance, as her hypocritical religious fiance predictably rapes her when she begins to display signs that marriage may not be for her, at least not to him. At the same time, hers is the most tragic arc of the trio, as she finds herself betrayed and manipulated by the culture she has so invested herself in. At times, western viewers may have to remind themselves that the seemingly innocuous images presented here are so revolutionary in Islamic culture as to provoke a death warrant on the filmmaker who fashioned them. What seems like a throwaway glimpse of Layla clad in a bra might easily go unnoticed, but I couldn't help thinking of Janet Leigh in Psycho, and how Hitchcock used her half naked form to inform his audience his film was about to break a few established rules. That a female filmmaker is willing to endanger her life to tell her story makes a mockery of Hollywood's reluctance to 'take a gamble' on women directors. In Between is by no means a perfect film, and its protagonists are equally flawed. But that's what makes them so real. Hamoud isn't interested in making her characters 'likeable'. They're not seeking our approval, just our acceptance. In Between is in UK cinemas September 22nd.